When I think "sandbox games," I think Grand Theft Auto 4. I think of tossing semi-trucks in Crackdown and tooling my ride in Saints Row. I think of running across latticework and leaping to ramparts, to wait, to watch and think, in Assassin's Creed. When I'm alone and tired I sometimes think The Sims, but, embarrassed, I don't usually utter it. The emergent game, the "do whatever you want" game, the paidia "childish game of amusement." Narrative be damned, sandbox is here to stay. The idea of the sandbox is one of emergence. A game that approaches you with a task without giving away how you are meant to complete that task. Part of the "game" is figuring it out. I have one in mind. One I'm quite in love with right now. I mean to introduce to you, the somnambulant, to Solar. It doesn't look like much, but Solar has it where it counts. 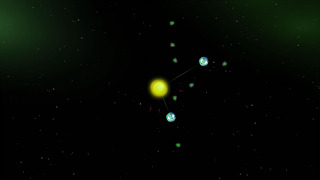 Solar, like Flow on the PS3, is an emergent sandbox game that allows you to play however you want. You control a single star--a sun--and have the ability to wander the galaxy in search of planets to capture in your gravitational pull. The goal of the game is obscure--gain more mass by absorbing planets into you. Planets can absorb asteroids that orbit them like moons and gain mass as well. So it goes: planets absorb asteroids, you absorb planets! Hierarchy aside, Solar allows for many different kinds of play. I spent a ton of time in the game's main mode "Sandbox Mode" making two orbiting planets denser and denser until they started producing spaceships. The spaceships would then fly around, protecting me from other stars and asteroids. In about ten minutes, there were dozens of spaceships, like little buzzing flies under my indirect control (they will follow you around, but you can't directly influence them). There are elements of real-time-strategy in the game. There are puzzle elements, too. Solar is difficult to categorize because it's pathos lies in the execution of an idea instead of the execution of objective. But for those of you who need objectives, there are those too. Challenge mode allows you to do a timed run to goals like turning a planet into a sun, becoming a black hole, destroying another sun. Solar is not the first, nor will it be the last, emergent sandbox title. Flower, recently, on the PlayStation Network takes the element of discovery and makes it beautiful. It's the same with Solar. There's something peaceful, exciting, and rewarding to playing a game to understand the point of why you're playing it. It's the same sensation as starting a novel in the middle and discovering the plot as you go. That's what's so great about Solar. It throws you into the deep end, then it expects you to learn how to swim.